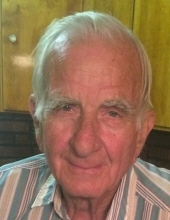 Celebrating the life of Alfred Lee Keen, Sr.
Obituary for Alfred Lee Keen, Sr.
Alfred Lee Keen, Sr., age 81, of Cedar Bluff, VA passed away Thursday, April 11, 2019 at Bristol Regional Medical Center in Bristol, TN. He was born September 6, 1937 in Russell County, VA. He started working at Simmons Chevrolet, then Jack Sykes in 1973, and then Ramey Automotive, retiring in 2009 after 51 years of working as an auto technician. He was preceded in death by his parents, Robert and Elease Whited Keen; his wife, Sandra Sue Beaver Keen; sister, Allie Gray Eichelberger; 3 brothers, David Keen, Harvey Keen, and Terry Keen. Those left to cherish his memory include one son, Al Keen, Jr. of Cedar Bluff, VA; two granddaughters, Amanda Keen and Abby Keen; 5 sisters, Ella Mae Vandyke of Lebanon, VA, Beatrice Ray and husband Gene of Richlands, VA, Jane Ferebee and husband Jim of NC, Nell Stallard of Lebanon, VA, and Carol Ball and husband Michael of Honaker, VA; 3 brothers, Robert Keen and wife Wilma of Swords Creek, VA, Vernie Keen and wife Betty of TN, and Howell Keen of Swords Creek, VA; several nieces and nephews also survive. The family will receive friends from 6 – 9 p.m. Monday, April 15, 2019 at Singleton Funeral Service in Cedar Bluff, VA.
Funeral Services will be conducted at 1 p.m. Tuesday, April 16 with Pastor Doug Johnson officiating. Entombment will follow at Greenhills Memory Gardens Mausoleum at Claypool Hill, VA. Pallbearers will be family and friends. The family of Alfred Lee Keen, Sr.is in the care of Singleton Funeral Service in Cedar Bluff, VA.
To send flowers or a remembrance gift to the family of Alfred Lee Keen, Sr., please visit our Tribute Store. "Email Address" would like to share the life celebration of Alfred Lee Keen, Sr.. Click on the "link" to go to share a favorite memory or leave a condolence message for the family.